As the year draws to a close, two new surveys of likely voters show that they are ready for immigration reform and frustrated with those who stand in the way. The independent surveys were conducted by Basswood Research and Harper Polling. Basswood surveyed 1,000 likely voters in 20 Republican-leaning congressional districts, including two in Ohio. The Harper research is based on an automated phone call survey of 501 likely voters in Ohio. The Basswood sample favored Republicans by a 6.7 percent margin. Generally speaking, Basswood found that voters, including Republicans, support all of the key provisions of broad immigration reform by wide margins. When asked if voters want Congress to “leave things as they are” or “pass new laws that are not perfect, but which do attempt to fix the serious flaws in the current system,” they chose the imperfect fix by a margin of 77 percent to 15 percent. And in what may be a surprise to some, their support for a process allowing earned citizenship is strong. Only 17 percent oppose any allowance for a pathway to earned citizenship. Fifty percent said they approve of a pathway if it were combined with stronger border security. But when asked if they approve of a pathway to eventual citizenship with or without enhanced border security, 76 percent said yes. The survey also indicates a very high level of dissatisfaction with lawmakers. Republicans clearly are taking the biggest hit. While 58 percent of respondents disapprove of President Obama’s performance, a whopping 70 percent disapprove of the job that Republicans legislators are doing. In these Republican-leaning swing districts, President Obama and Democratic members of Congress have higher approval numbers than their Republican counterparts. The Harper Survey shows similar results. Republicans were more likely than Democrats to say that the country is heading in the wrong direction, and they were also more likely to say that our current immigration system is broken. 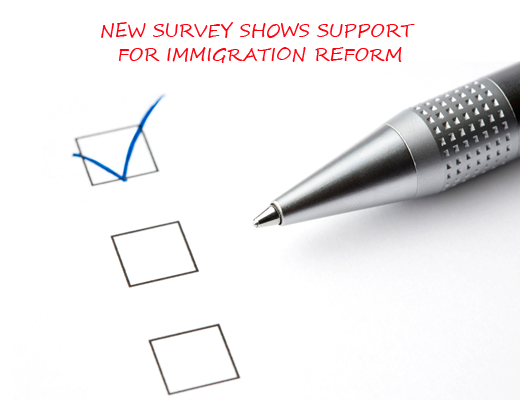 Harper also found that broad immigration reform has strong bipartisan support, including 66 percent of Republicans. Republican support is not only broad, it is also fairly intense. Among Republicans, those who “strongly support” broad reform that includes earned citizenship outnumbered those who “strongly oppose” it by more than a two to one margin (31 percent vs. 14 percent). When Harper pollsters asked specifically about a pathway to earned citizenship (without reference to other aspects of reform), 78 percent of Republicans responded favorably — compared with 70 percent of Democrats. The survey specified that in order to earn citizenship, undocumented individuals would need to pay fines, pass criminal background checks, learn English, pay taxes and wait for at least 13 years — similar to the provisions included in the bill the Senate passed earlier this year. Like the Basswood survey, Harper also found a measure of urgency among the likely voters they surveyed. Sixty-nine percent of Republicans and 78 percent of Democrats say it is important for Congress to enact immigration reform this year. When Harper asked how this issue would affect voting in next year’s congressional elections, 41 percent of Republicans said they would be more likely to vote for someone who supported immigration reform, compared with only 18 percent who said they would be less likely to vote for such a candidate. This effect was even more pronounced among Democrats and Independents. Collectively, these finding suggest that voters are ahead of legislators on immigration reform and frustrated by the slow pace — so frustrated that it could adversely affect their likelihood of voting for candidates who do not favor reform. This marks a sea change from previous attempts to reform immigration, when opposition voices outnumbered and drowned out supportive ones. This time around, right-leaning evangelicals have joined Catholics, Mainline Protestants, small business owners, educators, and law enforcement officials and organizations in a broad and urgent appeal to Congress to fix immigration policy. Conservative Republican legislators have a chance to demonstrate leadership on this issue, but the window is narrowing. Polling suggests that they may take a hit in the voting booth if they continue to allow the impression that they are standing in the way of reform. Should they lose enough seats in the House, they may lose nearly all opportunity to shape reform, as well as dig a hole with Latino voters that will haunt them for decades. Now is the time to act. It won’t last for long. Carl Ruby is a consultant for the National Immigration Forum and Bibles, Badges, and Business for Immigration Reform. Visit carlruby.com to see how he is networking among evangelical leaders and members of Congress to reform immigration. The opinions in this essay are those of the author and do not necessarily reflect the positions of the organizations he represents. They may not be construed as the opinions of other writers or of OCR staff.